The dissection course is performed as a demonstration by experienced hand surgeons on fresh, non-formalin fixed, hand and forearms. The course is aimed for nurses, occupational therapists and physiotherapists working with patients with hand trauma or hand disorders in Denmark and Sweden. The course has been held since 2003 and is a cooperation within the region of the Öresund together with Department of Hand Surgery, KAS Gentofte, Denmark, Department of Anatomy, University of Copenhagen, Denmark and Department of Hand Surgery, SUS, Malmö, Sweden. 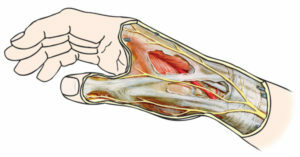 To know the anatomy of the upper extremity from the shoulder region to the fingers, with focus on forearm and hand. To value different surgical exposures and anatomical structures and their topography. The course is a one day session with demonstration of relevant surgical exposures and anatomical structures of the various anatomical regions in groups consisting of 7-8 participants. All limbs, obtained through a structured formal donor skim, are non-formalin fixed, fresh and the donors are tested for hepatitis and HIV. Around 24 seats for participants are available with participants particularly from Denmark and Sweden. The fee includes all course materials, all refreshments and the course lunch. You are only officially registered to the course when the fee is paid and when it is registered at the secretary. It is important that name, address, home phone and E-mail address to home and/or work are sent to the secretary Anita Filholt. Mail: anita@handdissection.dk.